So with all the talk of the new Cinderella movie I remeber the animated version and thought it would be cool to cosplay cinders poor clothing rather than a ball gown. As I've nowhere to store a ballgown. I've see HA versions of the ball dress but no one has tried to do her other outfits in a HA fashion. Now the Grimm story was published in 1812 -according to wiki- I wanted to make it from that kinda era. 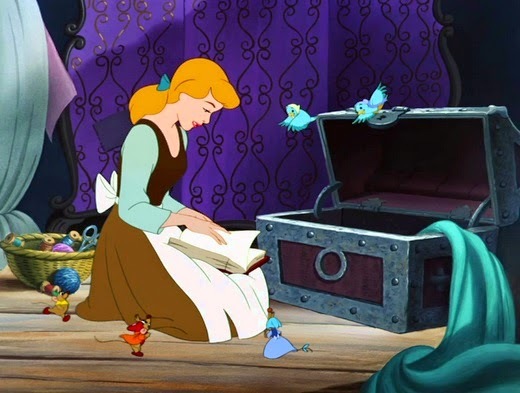 I surmised Cinderella would be wearing clothes that wasn't the height of fashion. Looking at some of the paintings of late 18th century servants for reference I realised I could put most of the outfit together from what I had with just one addition. First I had to dye my long sleeve shift blue to match the disney colours. Then I had to make some quilted jumps...originally I intended to make them brown but I didn't have any of the right fabric in my stash. So instead I erm...upcycled a failed skirt. 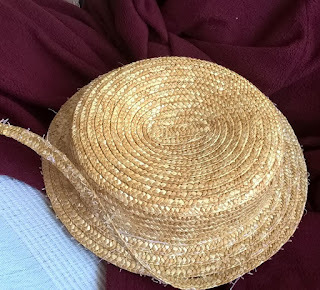 My inner batting layer was some felt -not the craft type- and inside layer was leftover cotton. I had to tack the layers together first then chalk out the quilting lines. So I started with the front panels. I took the oppertunity to use one of the decorative stiches on my new-ish machine. Then I sewed the pannels together, made the eyelets by hand (spiral lacing). Started binding the edges front first. I've been wanting to make this outfit for a while but it was the hat that jumped out at me. 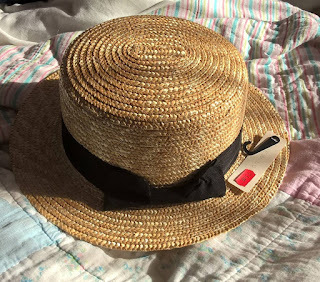 It's the hat that particularly jumped out at me. 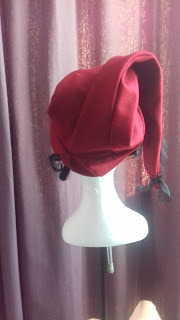 I was looking for a regency cap that was easy to pack in a suitcase that wasn't just your standard regency turban and this fitted the bill. It took a while to figure out the right shape. 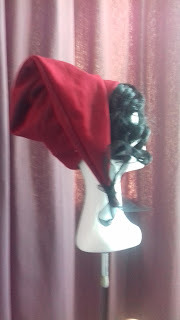 The original was in velvet but that wasn't an option so I used a nice wool mix I had some scraps left. I cut out a triangle for the pointed part then realized it wasn't going to be big enough so made a larger band with a black cotton facing then attached to the open end of the triangle pleating it on one side to take out the ease and for decoration. 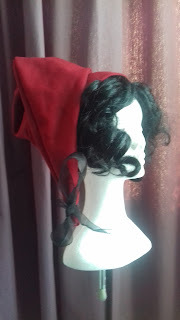 I added some leftover ribbon to the end for decoration. In the images the point is pinned in place but I intend to tack it in place once I've added any further trim which I'm just deciding on. I'll also be tacking some faux ringlets on the inside for instant perfect curls. This shows how much my skills have improved. 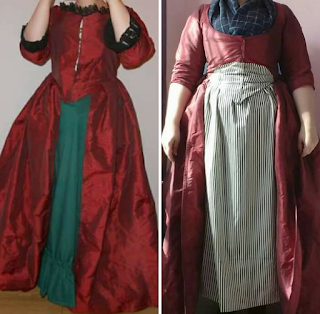 I needed a 'georgian' dress so I dug out my old red one I made ages ago. I've never been happy with how it fitted but it was one of my first attempts at making up a pattern from patterns of fashion. Was meant to be circa 1780s in style. 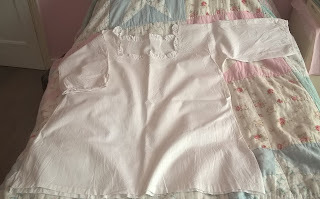 I removed the lace from the neckline and cuffs. 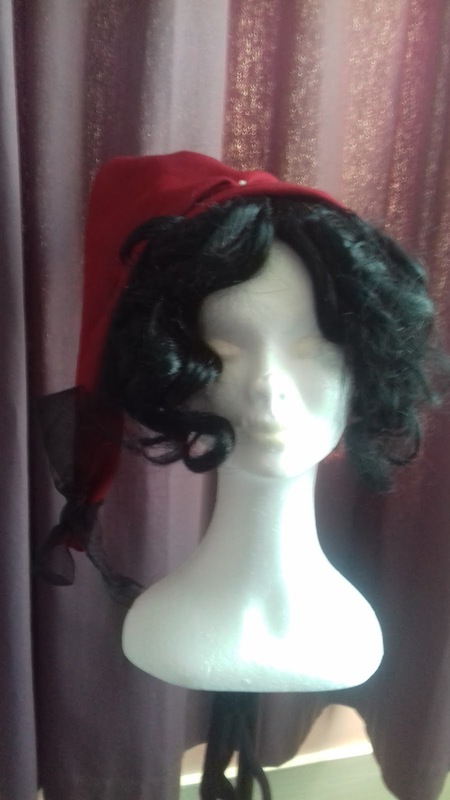 Then took off the hook n eye which clearly was causing gaping. Next thing I did was try it on over stays and pin the front tightly. 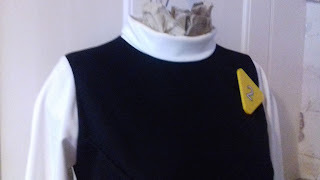 Then chalked on where I needed to cut down the neckline and where I wanted the 'zone' front to be. Then I pinned along the lines. You can see the boning is making the bodice sit oddly. The blue line is where the neckline would be. The green where the contrast fabric panel needed to go. This was the point where I removed the boning I had in the front of the bodice as it was throwing off the shape. I also unpicked the skirt for a couple of inches. I traced the shape of the front and then added a seam allowance. I appliqued the striped fabric on by hand. 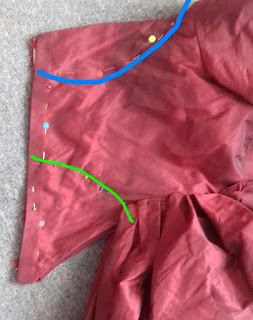 Tucking the fabric round the front of the bodice. I then stitched the skirt back on further back. It can still be polonaised or as is. 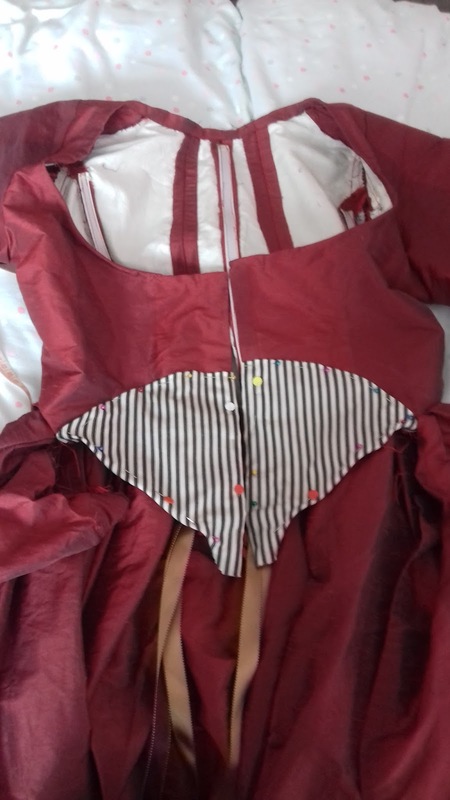 In the meantime I made a striped petticoat to match the zone front. The only thing left is to sew the hook n eyes back on. I've even made a matching hat. Currently debating whether to add a sash or not? What do you think? I know I have been quiet for a while. Been a little busy but I wanted to fill you in on my latest project. I blame reruns of Man from uncle (the TV series not the film). It's got me into that 1960s style. 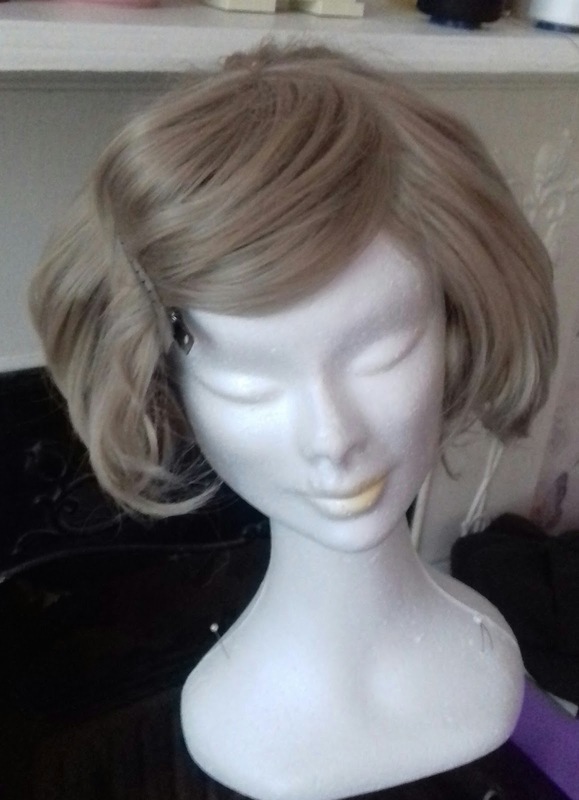 I've been gathering together 60s sewing patterns and have been attempting to style a wig using heated rollers and a setting pattern found on pinterests. Probably needs more backcombing for volume. But I'm hoping it's on the right track. 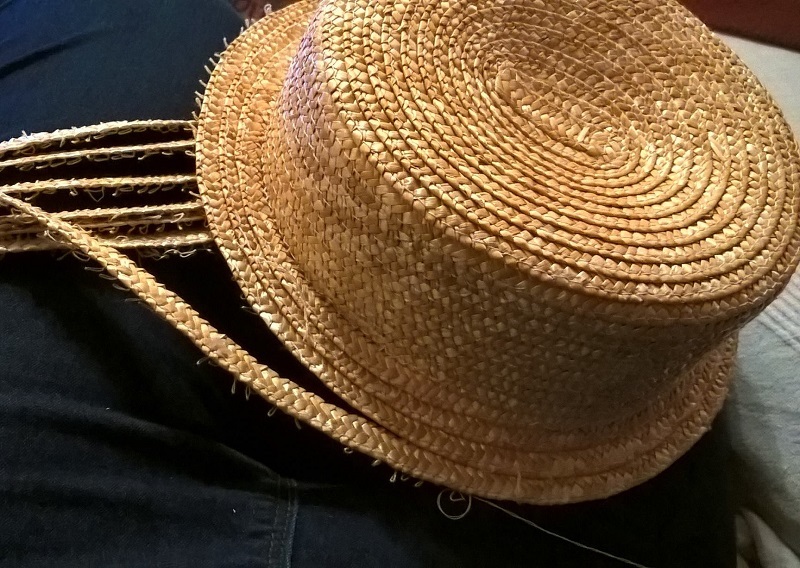 This little exercise is all in the name of cosplay. A femme version of a well known uncle agent. I think the badge with number 2 on it might be a big clue. Time for my post about the Jane Austen Festival (its quite expensive so I tend to go every other year). Lets start with the dresses which of course are very important. 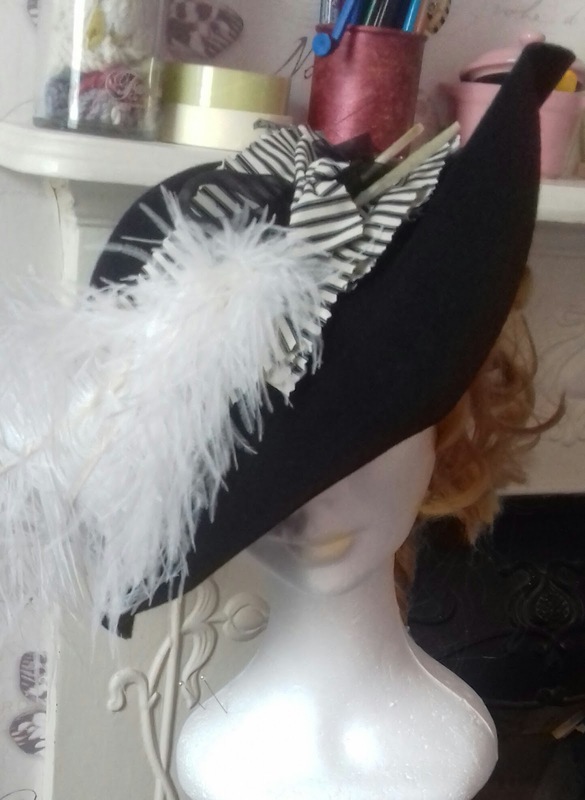 I had been working on them for a number of months as this time I needed four outfit and I had loaned my usual back up dresses to my mum. Well I don't need more than that as an excuse to make more. 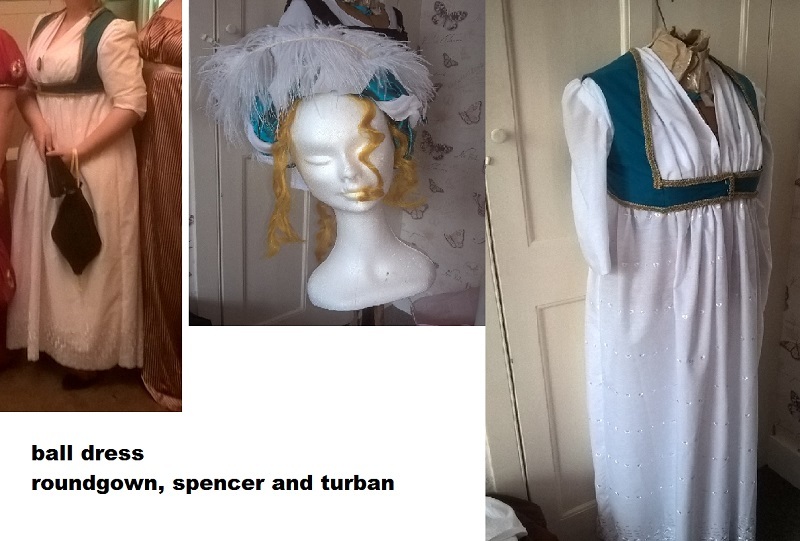 I had got much more confident in my sewing and more HA (historically accurate) this time round. I started of course as you should do with the foundations. So that was 2 more shifts to add to my current total. 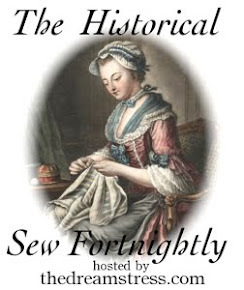 One of them needed to be longer sleeved 18th century. 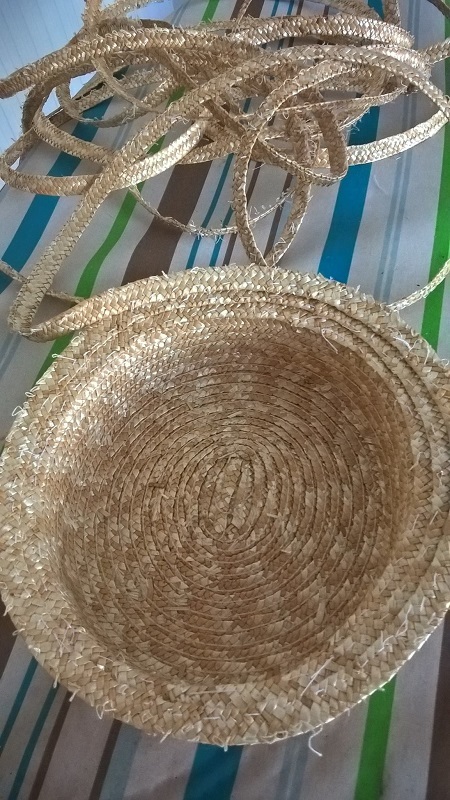 Then stays which I had completed a last year. 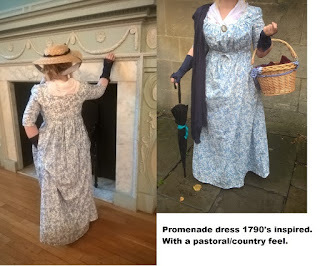 I wanted a 1790's transitional look and couldn't be bothered to fight with gussets. 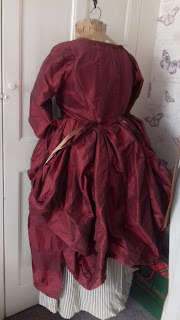 I was able to re use my petticoats, although had to adjust the length by rolling up at the waist, and used a bumroll for my 18th c outfit and of course pockets. 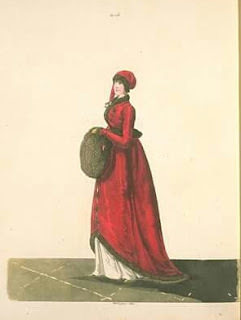 Yes I wear them with regency...even with a reticule on hand. And my fichu. Fichu, bib front gown, fingerless mitts, shawl, broach (cameo) bergere, basket and umbrella (as it was rather wet.) You can see from the photo of the back of the dress how the hem got soaked...my petticoat was pretty muddy too. Unfortunately I don't have many pictures of me wearing the dress as we were in a rush so didn't stop to take any before leaving and then I was dancing most of the time. I will post a more detailed description of the construction of this in the future. 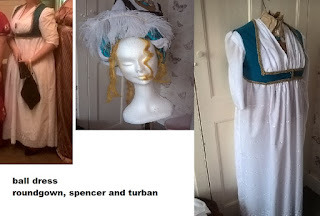 the dress was inspired by the tiedens toj dress and the sleeveless spencer was a happy accident as it was originally going to be the lining for and open robe but I liked it so added the gold trim. The headress was a last minute sew it up 5 mins before I leave job. Here I had fan and reticule to complement the look and the ubiquitous broach. 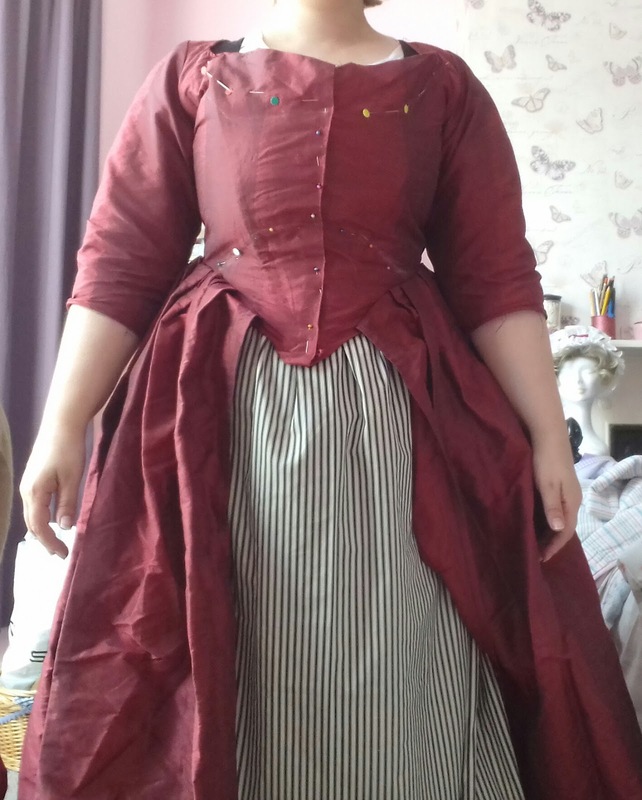 This was my attempted at a late 18th century working class dress. I had petticoat and a lined skirt. My shoes I had modified (another future post) shift, stays, fichu and 'caraco'. 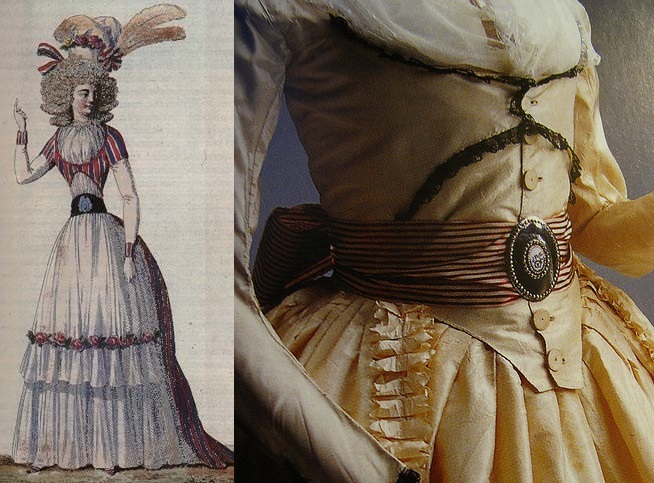 I like the 18th c look but to make it more later in the century I'd raised the waistline nearer the natural. You might reconized this item from previous posts its gone from a bed gown, to a short gown and now its more of a caraco. 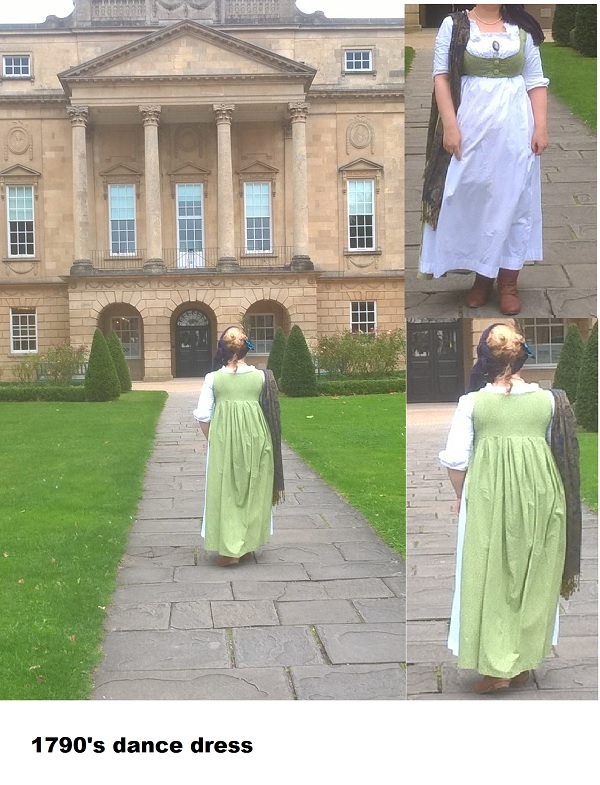 I wore this ensemble to visit no1 the crescent in Bath. I had a bit of a mini disaster with my outfit on the monday so I didn't end up wearing what I planned. Firstly the white bib front gown had shrunk since I last wore it so it was short and I struggled to move my arms. I was wearing modern foundations as I needed to be able to sit in the car for a long journey so couldn't wear the stays this then meant my bra peeked out over my chemise and the chemise over the top of the dress. Arrrgggg! So I tried to make the chemise look part of the dress and pinned it to the bra so that it covered the straps up. Then when I tried my sleeveless spencer over it the waistline was in the wrong place. So I had to take back my old open robe from my mum and wear that instead. This then threw out my colourscheme and thus I improvised. Blue shawl over shoulder. My blue sash I turned into a turban and added my green cameo broach then clipped on my feather bow on the back of my head so it looked like it was part of the regency turban. During the day I wore my ankle boots but changed to my dancing shoes for the workshop. And so ends the saga of the outfits. I'll post up a general post about the festival very soon. I know I've been quiet for a while. Blog posts take a long time to write and I've been busy busy busy. Anyway....I thought I'd do a sorta tutorial. I say sorta because its not that indepth. lol! It started with a hat, not just any hat, a straw boater in a sale. Ignore the price, I got it even cheaper because it was broken. Hence my erm...cunning plan. 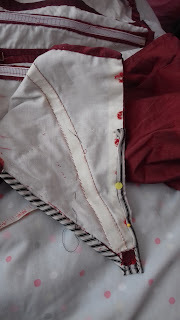 I got out the seam ripper and began to unravel it from the outside edge. 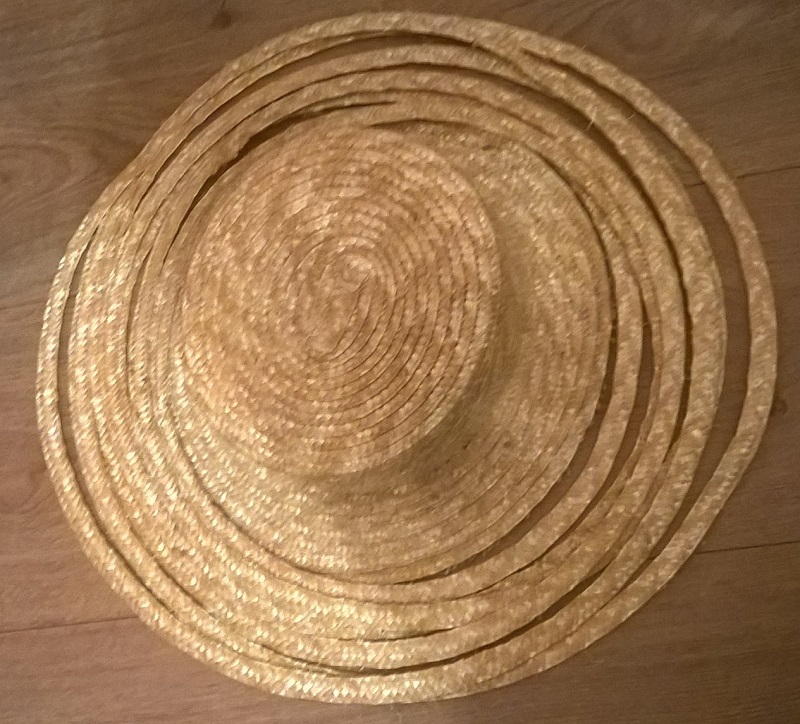 Originally intending a 'missy'/mary poppins sort of hat. 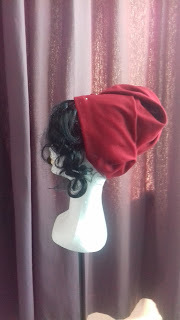 So now the crown was shallower but I kept its shape and width. 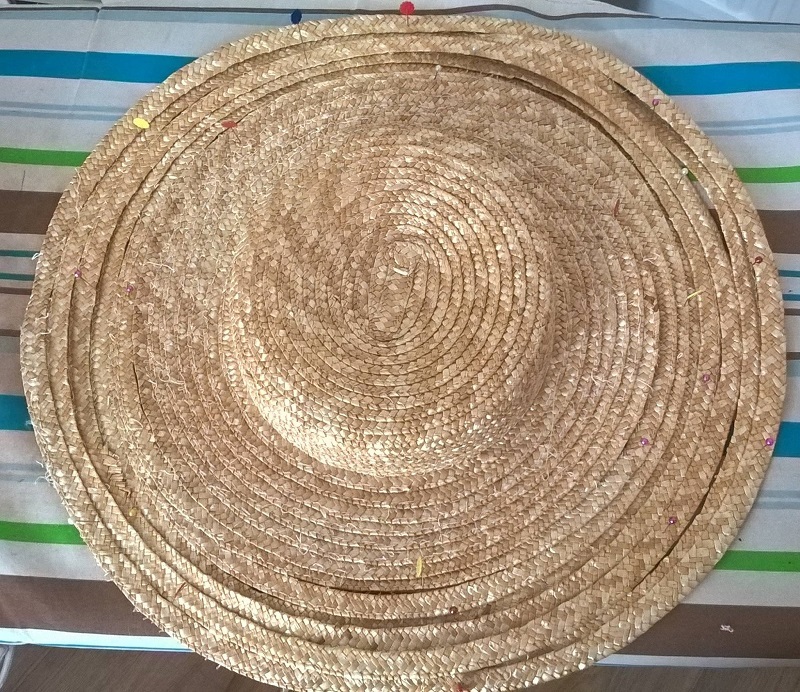 I got 90% of the brim done before my hands were cramping up and I couldn't hand sew the rest, thus I resorted to using the machine. I found this trickier as you have less control. But I still need to line it - as the straw messes up my hair and makes me itch - and trim it. 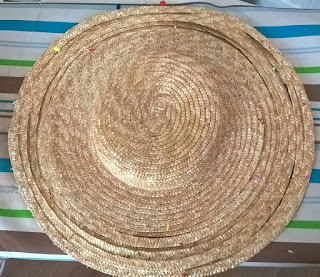 Materials: 100% Cotton and Silk. Pattern: TV 400 but I modified the pattern. Converted the front to a faux vest. I also narrowed the sleeves and added a self drafted collar. Year: The patter says 1871 but due to my modifications it probably sits later in the era. How historically accurate is it? Well the patterns HA and for a change the materials are too. Hours to complete: I lost track as it all got spread out over several weeks. 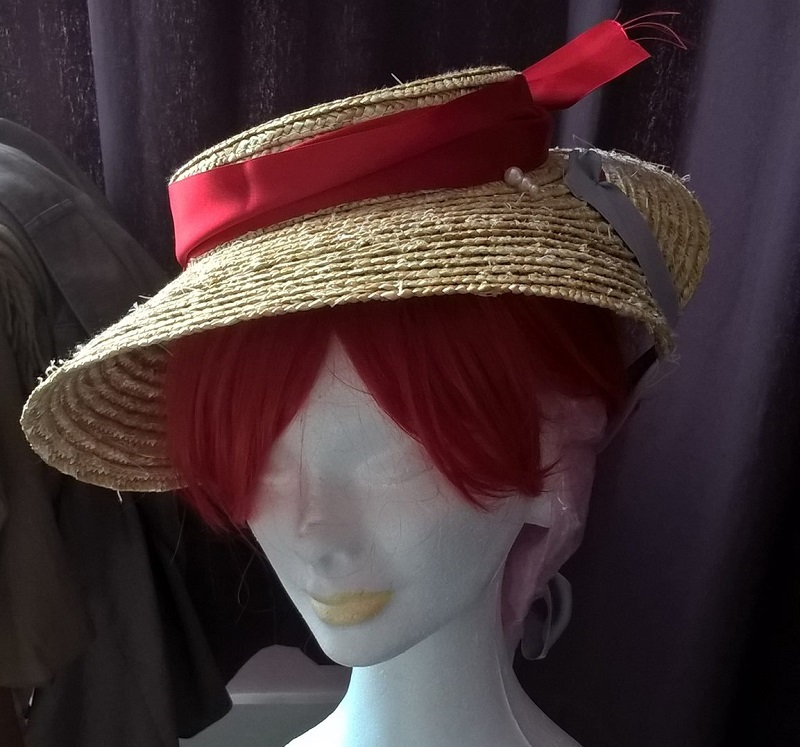 First worn: For pics the other day but when I finish the full outfit it will be worn in February. 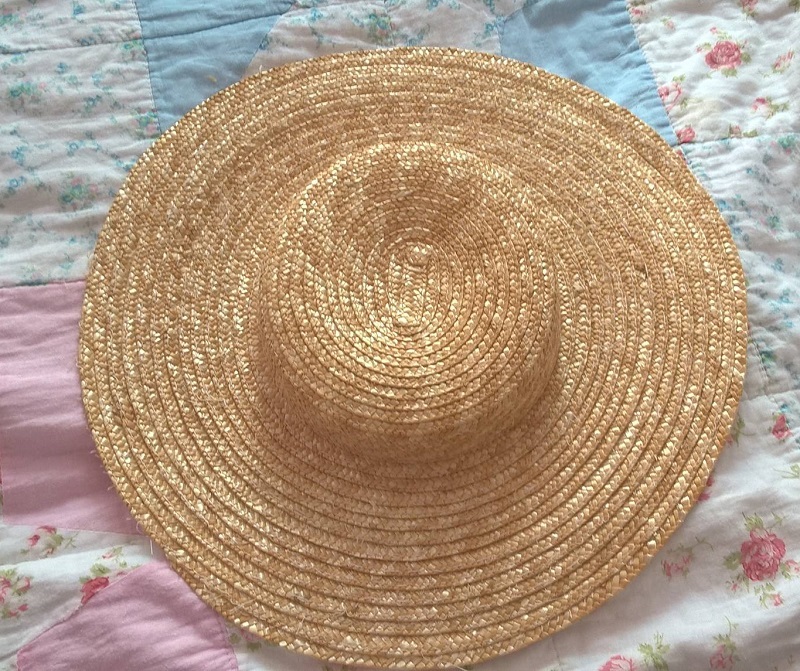 Total cost: I was quite surprised it came to £25! !